Like swallows to Capistrano, the Piper Cubs return every year to this town on the west branch of the Susquehanna, where most of them were built. Traditionally, Cubs are yellow. The color isn't mandatory, and some early and late models were painted otherwise, but yellow is what we've come to expect--yellow with a black flash along the fuselage, and with two black cylinder-heads projecting on either side of the nose. Thus accoutered, a Piper Cub is one of the most distinctive aircraft in the world. With a couple hundred tied down beside the grass runway, and with others taking off and landing all day long, the impression is a convention of motorized canaries. 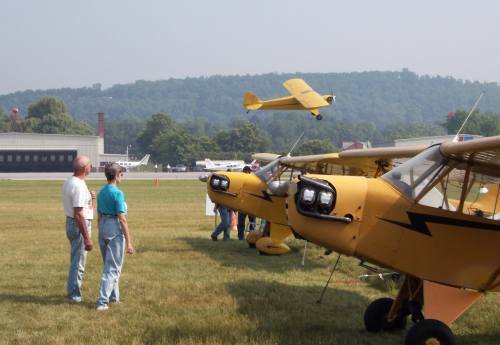 The event that brings the Cubs and me to Lock Haven is the Sentimental Journey, when the town plays host to anyone brave enough to fly a venerable and underpowered airplane through the wooded mountains and misty valleys of mid-Pennsylvania. Not every arrival is a Cub, but most planes date to aviation's first half-century. William Piper was 22 when the Wright brothers made their first powered flight; he died not long after Neil Armstrong walked on the moon. In the meantime, like Henry Ford with his Model A and Volkswagen with its Beetle, Mr. Piper built the perfect vehicle for its era, which in the case of the classic J-3 (the plane everyone pictures when the Cub is mentioned) lasted from 1938 to 1947. Then, like Ford and Volkswagen, his company floundered, unable to recreate the magic of its one perfect design. As originally built, the J-3 has fuel for only three hours in the air. To make the Sentimental Journey, therefore, requires both stamina and foresight. 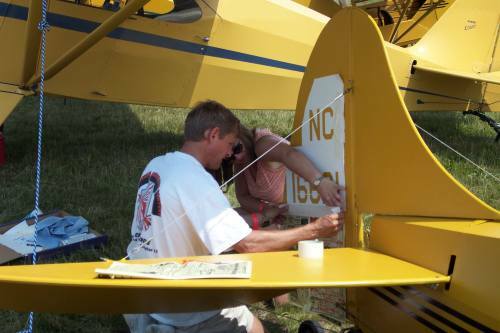 Len Buckel, a 71-year-old pilot from California, installed extra fuel tanks in the wings of his J-3 before he made his first Sentimental Journey in 1986, and he generally sets out for Lock Haven with a week to spare. "They act like it is a big deal coming 2,500 miles," he says, "but I just think of it as 25 individual 100-mile trips." The performance of a Piper Cub varies with the weather. Even the temperature matters, and so of course does the direction and speed of the wind. On that first Sentimental Journey, Mr. Buckel bucked headwinds in both directions, obliging him to spend 81 hours at the controls. Last year, with a more powerful engine and kinder winds, he cut that to 64 hours. Coming and going, he was nine days en route, and he landed at 20 airports to stretch his legs and top off his fuel. Three Californians are making the Sentimental Journey this year, along with half a dozen Canadians. But most planes come from the eastern United States. Among them are two J-2 models built in 1936. One is based in western Pennsylvania and belongs to Robert Stewart, 82, who bought it in 1939 but traded up to a more powerful model. Years later, Mr. Stewart located the plane, bought it again, and restored it with the aid of his sons and a granddaughter. The young woman, April Stewart, made her first solo flight in the J-2 at the Sentimental Journey in 1998. It was supposed to be a secret triumph, while everyone else was busy with the nightly corn-bake, but word got out, and hundreds lined the grass runway to cheer April's flight of passage. The J-2 was supplied with a 37-horsepower engine and cost $1,270 at the factory. Those figures had nearly doubled by the time Len Buckel's J-3 was built, and brakes had been added. The design's final iteration was the PA-18 "Super Cub," manufactured off and on until 1994, by which time the tube-and-fabric trainer boasted 150 hp., an electric starter, radios, and an $80,000 price tag. The Cub's popularity can be measured by the attendance at the Sentimental Journey: over 4,000 visitors by the time I leave the parking lot on Friday afternoon. (I drove to Lock Haven, and so did most of the others.) Given that one of the top-selling items at the vendors' tents is a kid's tee-shirt with the slogan "Future Cub Pilot," the tradition seems likely to endure for at least another generation. The photo above and a somewhat different version of this article first appeared in the "Soundings" feature of Air&Space/Smithsonian in its issue of October-November 2002.